CAMERA staff have prompted correction of a Los Angeles Times article which incorrectly stated that SodaStream’s headquarters are located in the West Bank. While the beverage carbonation company has a factory in Mishor Adumim, in the West Bank, its headquarters are in central Israel, in Airport City, abutting Lod. 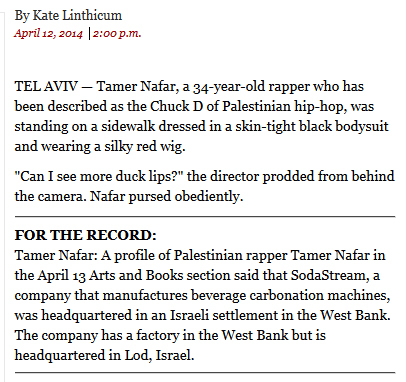 [Rapper Tamer Nafar] was channeling Scarlett Johansson for a video sketch skewering the actress for serving as a spokeswoman for SodaStream, a company boycotted by Palestinian activists because it is headquartered in an Israeli settlement in the West Bank. For additional Los Angeles Times corrections prompted by CAMERA, see here.